Rail passengers travelling this bank holiday weekend are being warned to expect major disruption. Main stations in London, and services to Wales and the north of England, will be affected by engineering work. It is being described as Network Rail's biggest August bank holiday engineering project, costing £130m and involving 17,000 staff. On the roads, part of the M1 southbound has reopened following a serious incident. Eight people have died and four people have been taken to hospital after a crash involving a minibus and two lorries near Newport Pagnell, police said. A spokeswoman for Network Rail said on Saturday that the works were "going to plan" and that the travel warnings remained in place. 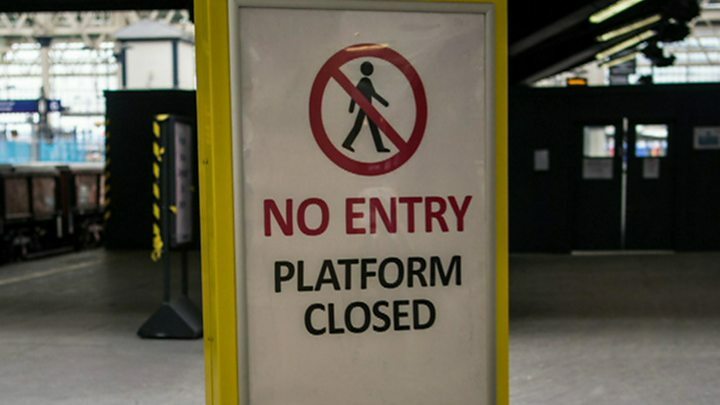 Euston, one of the major stations in London, will be closed completely on Saturday and Sunday. Work will also take place at Waterloo, London Bridge, Liverpool Street and Paddington. The so-called great north rail project will see disruption in the Midlands, Wales and across northern England. The aim is to reduce overcrowding and offer faster and more frequent services in the future. Virgin Trains said it expected services to be very busy on the East Coast Main Line because of the closure of Euston and the Edinburgh festivals coming to an end. And for its the West Coast route, a spokesman said: "We are advising customers to avoid travelling on our west coast route on Saturday or Sunday unless necessary." Network Rail admitted there was never an ideal time to carry out engineering work but said up to 50% fewer passengers travelled on bank holidays. Waterloo has already been affected by work to lengthen platforms to increase capacity. A Network Rail spokeswoman said: "We apologise to our passengers for the added disruption to their journeys and thank them for their patience." Travel trade organisation Abta estimated that 2.1 million British holidaymakers would travel abroad over the weekend, with Spain, Turkey and Greece among the most popular destinations. Coach operator National Express is putting on an extra 4,000 seats on routes affected by the Euston and Waterloo works. The AA warned of congestion on the roads as people avoid problems on the railways. Have your been affected by bank holiday travel disruption? Let us know about your experiences. Email haveyoursay@bbc.co.uk with your stories and pictures.